The tympanic membrane, or ear drum, serves as the window into the middle ear. Otoscopy allows for direct observation of the tympanic membrane and external auditory canal and is a practice used to observe the ENT complex with more clarity. We’ll take you through the ear exam and show you details of the structures seen within the ear. Otoscopy is one of the primary methods used for diagnosing patient complaints for the entire ear-nose-throat complex. 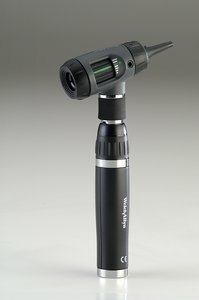 A well designed otoscope will provide illumination, magnification, and air pressure capability for checking tympanic membrane mobility. The basic steps are the same for any otoscope, but we’ll be showing you how to use our Welch Allyn MacroView Otoscope – which allows you to see three times the area of the ear canal and tympanic membrane than a traditional scope in a single view. Step through how the parts of outer, middle and inner ear work together to support hearing and balance.